Happy New Year! 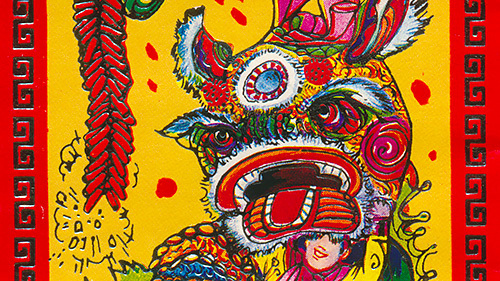 You can never get enough years period, so we're celebrating Chinese New Year today. Which just happens to be the Year of the Monkey. Naturally, it would fall on a Monday. Monkeys are like that. Being distantly related to the monkey, we wondered how could we celebrate the event photographically? 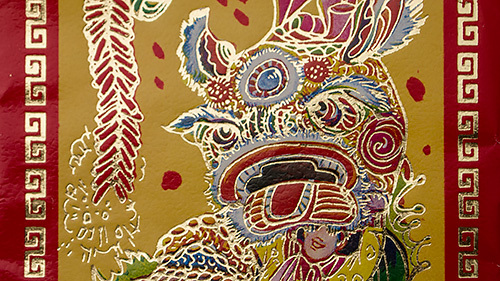 Why not publish a detail from a red envelope? We usually pass them out for Chinese New Year but we just happen to have kept one around, hoping it might reload one of these days. It's small, just 2.75 x 4.0 inches, the back side bright red, which continues to the front frame. 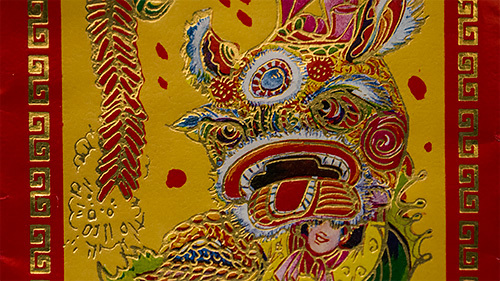 A colorful Chinese dragon outlined in gold is depicted on a yellow field with a firecracker string firing on the left side. A Scan. First we scanned it on a flatbed scanner (any one will do). But that reduced it to something like a printed illustration. You can't tell there's any gold at all. Natural Light Photograph. Then we simply photographed it in natural but not direct light. That captured the printed colors of the envelope and also reflected the gold. That's the approach we prefer. Bounced Artificial Light. Finally, just for a comparison, we shot it with a studio strobe bounced off the white ceiling. You could get the same effect diffusing a camera-mounted flash, though. But that either burned out the gold (too much light) or underexposed the printed colors (too little). Well, that's the thing about a new year. It all depends on how you look at it.